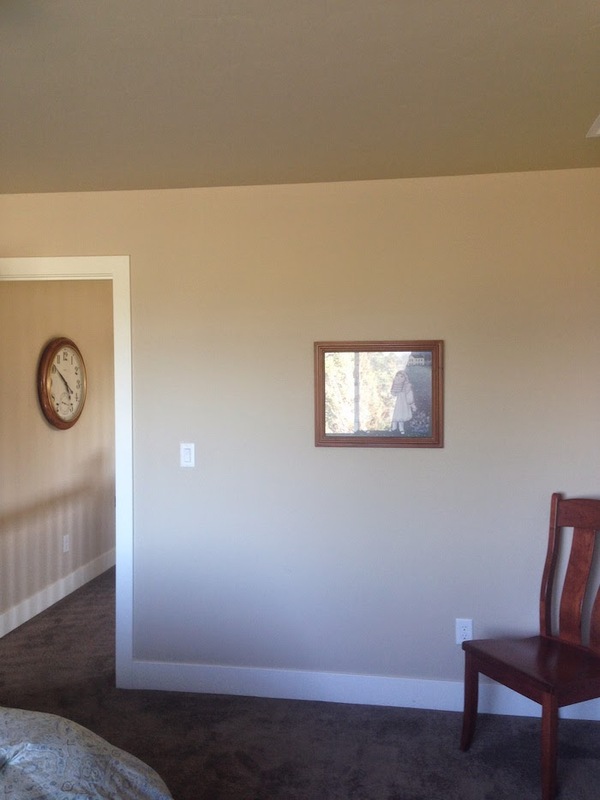 Below are some images of the room before. 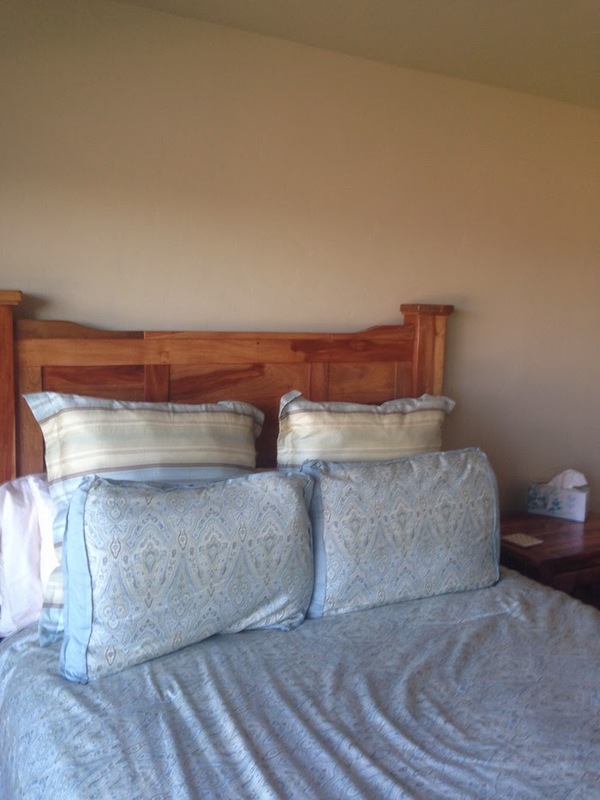 As I mentioned, they purchased the bed, nightstands and dresser after moving, and then they were just using bedding, a lamp, and art work that they already owned. Our goal for this makeover was to make it warm and inviting for guests while also doing it very quickly and affordably. The other main thing that my mom wanted differently was to add a more proportionate sized wall art to this wall because the current artwork was way too small. Here is what we came up with! We finished this in 3 days, and Bend is a rather small city with no near surrounding cities so we were limited to few stores to complete this (all the sources to the items are at the bottom). We wanted to keep the makeover affordable so we decided to use the existing comforter and euro pillows and just accessories it by adding new white quilted shams in the middle, and a light blue lumbar pillow. I love how the lumbar pillow had 3 dark buttons on it because it tied in nicely with the mirror. There was a lot of wall space above the bed so we chose to go with a circular mirror above the bed in order to bring interest. Design Tip: When you have a room with many pieces of furniture that are squared shape try adding some round objects, like in this case the mirror and round lamp shades, to bring interest and also break up all the square and rectangle shapes in the room! The lamps were also key in this makeover! Before the lamp was too dark, and there was only one of them. I love symmetry, especially in a bedroom, so we got two matching lamps to go on each nightstand. Design Tip: The height of the lamp should be proportionate to the height of the headboard, for both aesthetic reasons but also to add adequate reading light without you having to look down into the light. Don't want to buy new lamps? Just put some books under the lamp to add some height! I've been asked several times, where do you put your actual sleeping pillows when you make the bed? In this case I just tucked them behind the euro pillows. 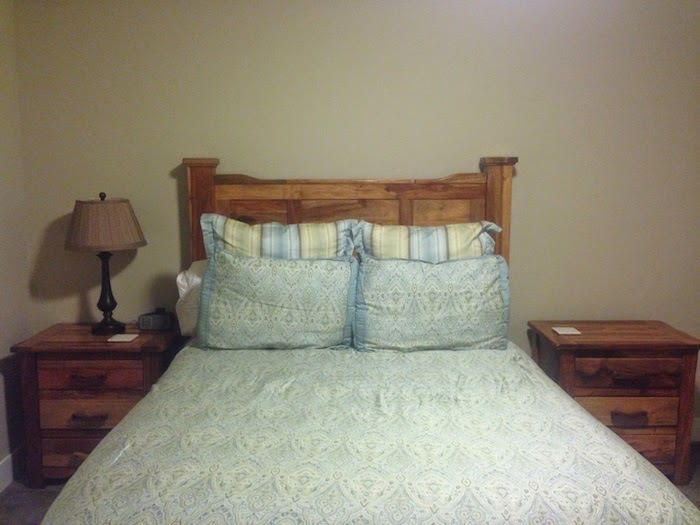 If I want to give added height to my euro pillows, like I do in my master bedroom because of our super tall headboard, I will lay the pillows laying flat on the bed and put the euro pillows on top. For the dresser area, we kept the piece of artwork and just added some accessories onto the dresser. If the lamp looks familiar it's because it's the lamp that used to be on the left nightstand, and I found another lamp shade in the house that went better with this color scheme. 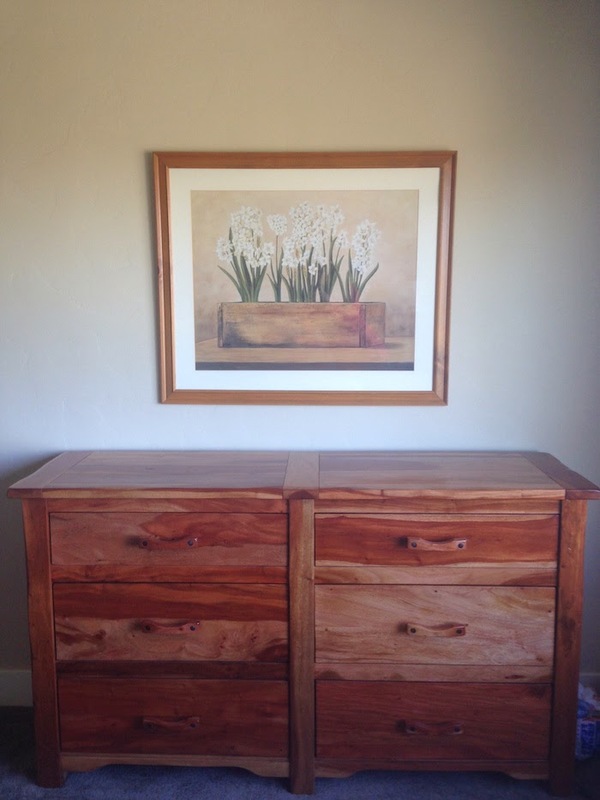 Design tip: On dressers you don't need to create symmetry but it's aesthetically pleasing when you create balance. When I had just the grass and blue jars on the left side it was too "heavy" looking on the left so I balanced it with the lamp on the right. Also, in terms of grouping things together, groups of 3 tend to look better than groups of 2, so in this case I used a tall grass and two blue jars on the left side. 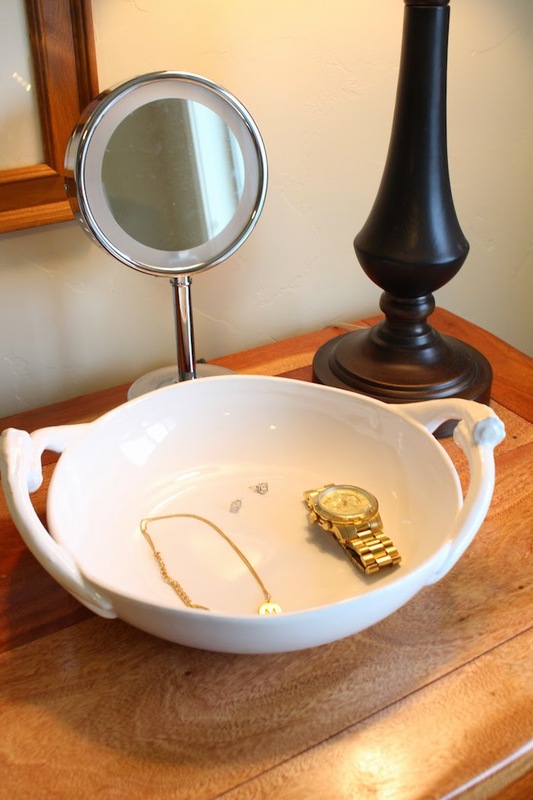 Since this is a guest room, we added a bowl so that people could have a designated place to put things if they choose. I was staying in this room, so I put some of my jewelry in there. I use a vanity mirror at home all the time, so my mom purchased this little vanity mirror when they moved so that I could have a mirror when I stayed at their house. It was a very thoughtful gesture, and also is very useful for other guests as well! The picture on this wall before was too small so I fixed that by adding a fern gallery wall. This was created from free printable art prints, and I will be sharing the prints and details on Wednesday. 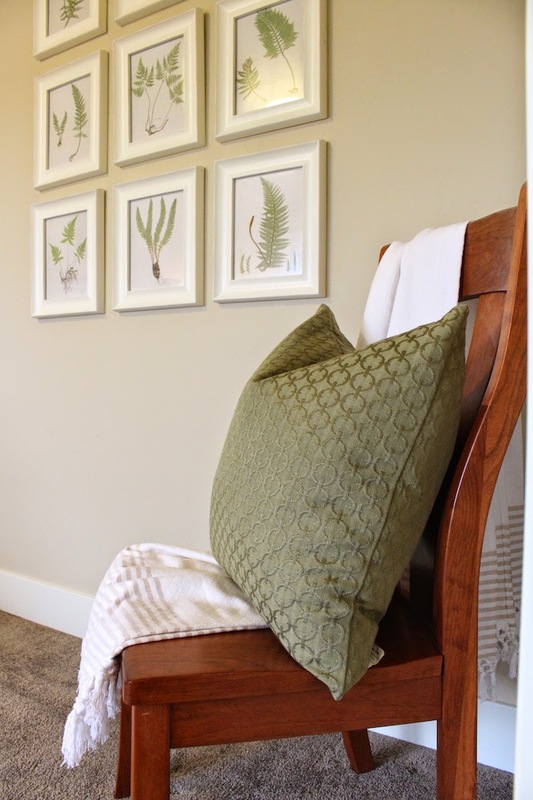 We kept the existing chair in the corner and I just added a toss blanket and stole this green pillow from the other guest bedroom to add some color. So what do you think? With 3 days and a little TLC we were able to make this space more cozy and inviting for future guests! 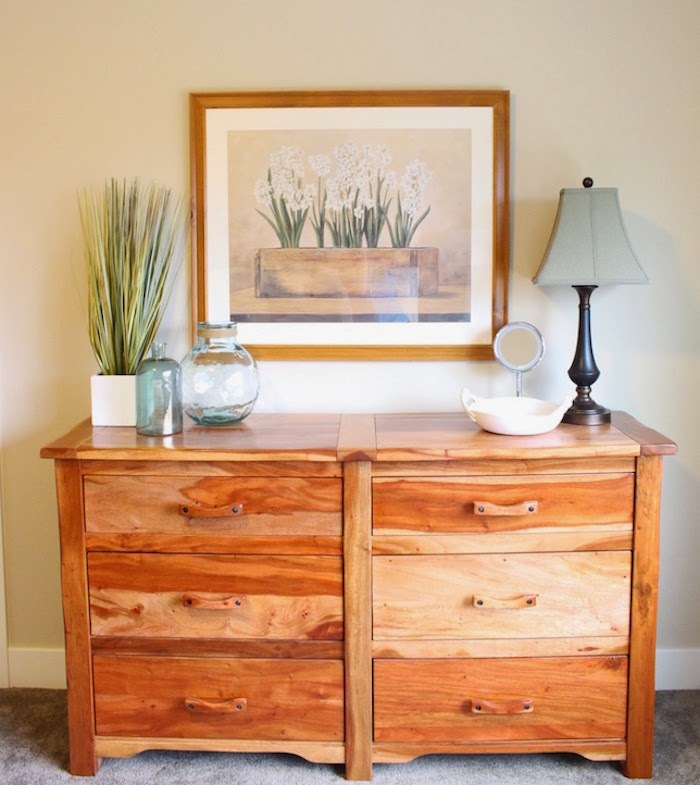 I love this, specifically the way you framed the dresser with the vases and accent pieces. She claimed that her Breastfeeding did not interfere with her teaching or her other school and work activities.